Uzbekistan Airways announced the launch of its first flight between Tashkent and Mumbai. The inaugural flight on Nov. 2 landed Mumbai Chhatrapati Shivaji International Airport early in the morning with delegates from Tashkent. Abzal Akramov, General Representative of Uzbekistan Airways in India, his assistant Eldor Ortikboev, representatives of the Uzbekistan Airways’ General Agency in India and the leadership of Mumbai Airport participated in the solemn meeting to meet the first passengers arrived in India from Tashkent. 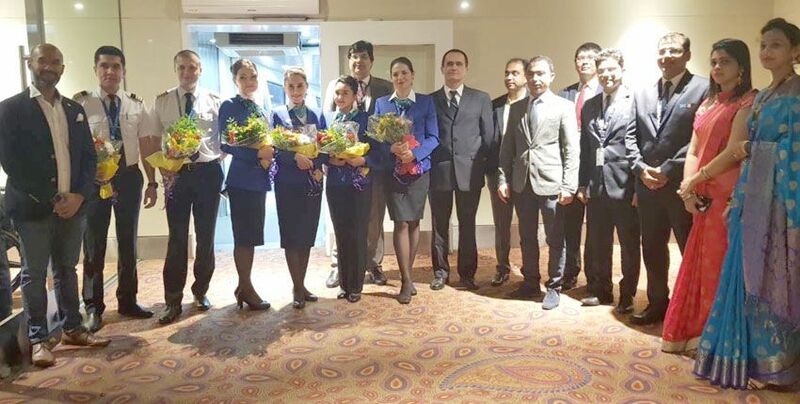 Also, the check-in of passengers on the first flight number HY-428 en route Mumbai – Tashkent was festive. Each passenger was given flowers and Indian sweets. A direct flight connecting Tashkent and Mumbai is operated three times a week, on Tuesdays, Wednesdays and Fridays, on Airbus A320 aircraft. The flight time is three hours and 40 minutes and the roundtrip air ticket price is US$ 395+.